help people who are suffering from mental and substance use disorders, get better. For more than 40 years, CenterPointe has been providing services for people who lack financial resources to pay for them, though they are continually sought out to do more. In 2014, CenterPointe embarked on planning for their next evolution—a whole health philosophy that addresses needs of consumers across the community. Grounded by the solid belief that every person has the ability to recover, CenterPointe makes pivotal treatment available for people suffering from mental and substance use disorders. Meeting people where they are and supporting them to gain control of their lives is what CenterPointe aims to do. By treating the whole person, mental health and addiction can be addressed together in real –time. This holistic approach, combined with open arms, distinctly sets CenterPointe apart. We constantly push boundaries to find better ways in helping people be well and never give up on the value of life. With a new strategic direction, tagline and positioning statement, the next natural step was to make CenterPointe’s visual image reflective of their newly branded words. KidGlov helped CenterPointe be the focus of attention with a new logo, style guide and color palette –“no more 1980’s star dudes.” These new graphical elements helped update the look of their marketing materials including: website, enewsletters, stationery, name badges, brochures, pens, videos, social media profiles and more. 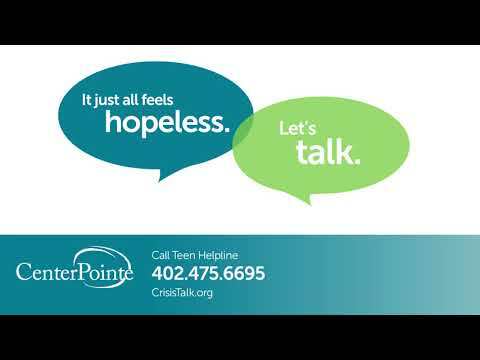 CenterPointe’s pivotal new brand was also incorporated within a campaign to promote the Crisis Line which included newspaper stickers, brochures with peel-off wallet card, ads and a billboard.